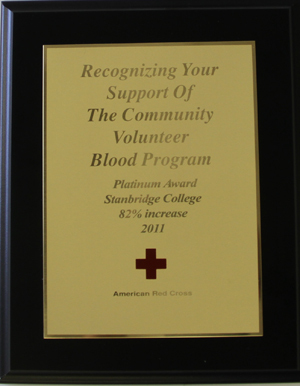 Platinum Achievement Award given to Stanbridge College by the American Red Cross. The American Red Cross recognized Stanbridge College with a Platinum Achievement Award in their March Recognition Event. Stanbridge College was honored with the Platinum Award due to an 82% increase in units collected from the quarterly blood drives in 2011. REACH would like to thank all of the students, staff, faculty and alumni who participated in all of our 2011 Blood Drives. Your support has not only assisted in saving the lives of hundreds of people in Orange County and the US, but it has also helped Stanbridge College REACH achieve a higher level of community service excellence. In continuing with our support of the American Red Cross, we are pleased to announce that our students and staff at the March Red Cross Blood Drive donated over 12 pints of blood and assisted in saving over 36 lives. REACH would like to thank all of the donors and the Red Cross for making this event another successful blood drive! The next Red Cross Blood Drive at Stanbridge College is coming up on Tuesday June 12th. To schedule an appointment please email vsauer@stanbridge.edu. Find out more about the need for blood donations, who it helps and if you are an eligible donor. Visit the Red Cross online at www.redcrossblood.org for more information.